The sacroiliac (SI) joint sits at the bottom of your spine, between the last vertebrae of the lumbar spine and above the tailbone. Your sacrum is a triangle-shaped bone at the base of the spine, and it is connected to your pelvis by the SI joint. This joint is the main culprit behind most people’s lower back and leg pain. However, diagnosing SI joint pain can be difficult since it shares symptoms with many other conditions, including herniated discs and facet syndrome. Your doctor will usually choose to do a physical exam as well as injections of pain medication to see if your pain is truly sacroiliac joint pain. 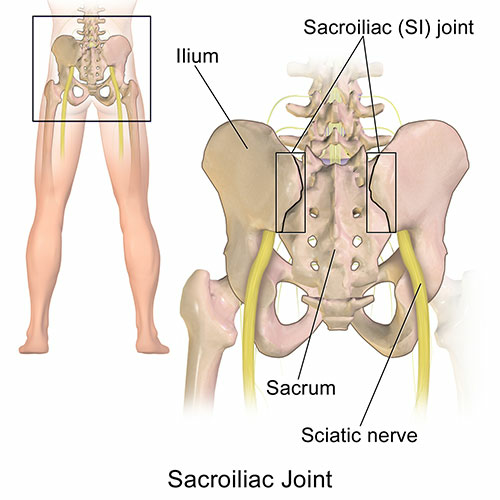 The sacroiliac joint has a layer of cartilage over the bone, which allows it to move smoothly. When this cartilage starts to break down with osteoarthritis, the bones will rub against one another, causing pain. In addition, many pregnant women will develop SI joint pain since during pregnancy the ligaments around the SI joint relax, preparing for birth. As the ligaments relax, there is increased movement in the Si joint, which can be uncomfortable. Any condition that causes you to alter your gait or typical walking patterns can also be the cause of your SI joint pain. Foot, hip, knee, and ankle pain can cause you to limp, putting more than average stress on your sacroiliac joint, causing severe pain. The first step in treating your pain is to confirm that it is your SI joint that is causing the problems. You doctor may recommend a sacroiliac joint injection or block, where they will use an X-ray and dye to direct a needle into your SI joint. Then they will inject a numbing medicine to see if that is successful in reducing your pain. Once your doctor has determined that your pain is truly SI joint pain, there are a few different treatment options. Some non-surgical methods include rest, over the counter pain medications, bracing and physical therapy to help strengthen the surrounding muscles. You can also use the sacroiliac joint block as pain management, combined with a corticosteroid for help with inflammation. If after several months, your pain in not reduced, your doctor may recommend a joint fusion surgery. This surgery aims to reduce the abnormal joint movements that are causing your discomfort. Diagnosing SI joint pain can be difficult because it shares symptoms with many other conditions. If you are tired of living with chronic sacroiliac joint pain, contact the doctors at Florida Spine Institute to learn more about the treatments available and how to best manage your pain.